Content Marketing ROI is probably the biggest question I get from marketers who are struggling to build their own business case internally. It’s why I wrote The Content Formula. We know our customers are tuning out advertising. And we know that as consumers, we are all consuming more information online. We are looking to get informed and we are looking to be entertained. And we don’t care where the content comes from. But we aren’t sitting around waiting for it. And we won’t go too far to find it. Building the business case is often a tricky proposition. We can’t point to the advertising guy or gal and make it all about them. But what is the ROI of advertising, really? I’ve never seen much convincing proof outside of direct e-commerce. So if you aren’t selling herbal supplements, can you really justify the spend on advertising. It is also important to remember that everyone inside the business creates content. And creators love their content like a momma loves her baby. Although some of the content your company creates may stink, we can’t call anyone’s baby ugly. So how do we build the business case for content marketing and answer the content marketing ROI question before we even really get started? It starts by building a strong business case that doesn’t just directly attack people, their teams or their budgets. So let’s start with how we answer the ROI question? 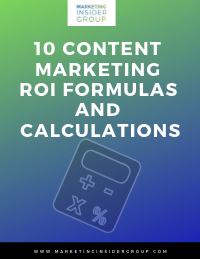 There’s very few benchmarks, a little research and some examples that have been published on content marketing ROI. Julie Fleischer at Kraft said it was 4x greater than even their most targeted advertising. 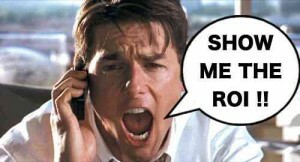 So the first way to respond to this question is to ask for the baseline: what is your company’s average marketing ROI. If you’re feeling cheeky, ask for the ROI of that last press release, the logo your company put on a golfer’s hat or on the side of a building. Then go about addressing each of these 3 components of ROI. Content cost: Content Marketing ROI starts with a solid understanding of content costs. How many marketers know the cost of the content produced by their firms? You need to conduct a content audit, or at least a sample of the content you produce. Apply some average costs and extrapolate that to really gain a sense for the size of the problem. Content Utilization: Sirius Decisions has reported that as much as 60-70% of content goes completely unused. How many businesses know what percent of their content even gets used? Any content that gets created but never used is 100% waste. So you need to not only track content production, but also usage. Content Performance: Finally, content marketing ROI needs to define the business value of the outcomes it generates. Most people start by talking about pageviews and social shares and clicks to something. But it’s important to first tie your content performance back to the business case that got you started in the first place. How many businesses have calculated the business value of any of their marketing outcomes? I have always believed that marketing should be accountable for results. We need to hold marketing accountable for ROI overall. This means that ALL marketing spend should be tied to quantifiable results that the sales team and executives can understand. Generally, our marketing should be focused on generating and then managing demand. But sometimes, the CEO or the board wants to “extend the brand,” get a story picked up by the New York Times, and sometimes sales folks want to work under the cover of a nice, massive awareness blitz. OK, so you’ve survived long enough to want to learn how to build the business case. There’s a couple of ways to go about building a strong content marketing business case. 1. Reach early stage buyers: most marketing is overly promotional (and we tune it out) but it is also just too early. Your business needs to get people to know your brand, like your brand and then trust your brand enough to want to buy from you. That starts with a significant amount of early-stage (or “dating before you get married”) content. It needs to be non-promotional and not overly creepy. You can’t push too hard because you want to get to a second date. A couple of ways to build the business case. Do you show up 1, 2 or 3 when your audience searches for solutions in Google for your category or topic? Identify your “Fair Share of Conversations” – what % of the online conversations on your product category are branded? What percentage of those are your brands. How different is that from your market share. If there’s a gap, it means your competition is wooing your prospects before you. % Unbranded Search traffic on your website – how many of your early-stage prospects are finding your company website. If you’re like most brands, you promote too much on your website and you need to build a brand publishing capability. Banner effectiveness at driving brand visits – this is easy. $1 spent on digital banner ads will under-perform a dollar on content marketing in almost any category. Cost of organic and social website traffic vs. paid – content marketing allows you to gain additional reach, engagement and conversion without having to pay for it. You can literally earn your audience’s attention vs. buying it. Cost of content that goes unused or or simply read and shared by no one- often the biggest marketing expense we find and it’s all waste! Time spent, Bounce rate on content vs. advertising landing pages – this will show how content marketing can help you reach early-stage visitors, engage and convert them to sales. Cost / Repeat visits, Time engaged with your brand – a classic awareness measure, this can help you measure the value even for brand awareness since these are visitors you would have never reached with ads. Subscribers, value per subscriber – this allows you to literally bring prospects into the brand fold so you can start to market to them. In order to answer the content marketing ROI question for your business, you need to be able to build a solid business case based on a deep understanding of your business. What is your business’ average marketing ROI and how can content marketing achieve a higher return? The answer comes down to understanding your content costs, usage and performance. From there, you have a few paths to building a solid business case that will allow you to reach new customers, engage them with your brand in a meaningful way and then convert them to new sales and long term relationships that provide real ROI. Are you interested in showing true content marketing ROI and developing your own Content Formula? Contact me here and let’s talk about how I can help. There are TV shows. And there are the ads that interrupt them. There are articles. And there are banners that try to divert our attention. We used to accept the interruptions because we knew they paid for the main event. But now that everyone is a publisher (even you), we avoid the ads. I know you sell ads, man. Ads are still important. Especially on niche sites like yours where there is a win-win-win for the publisher, the advertiser and the reader. But brands spend too much on ads that are wasted on sites that don’t produce a return, don’t reach their audience and don’t deliver a compelling message. You could sell more ads if they told stories people liked!!! Proving the ROI of content (and/or inbound) marketing is an issue I have come across many times and I admit I don’t have a perfect answer. The only measure I can come up with is relatively simplistic and assumes content / inbound marketing is an add on to whatever marketing the business already has in place. I ask how many leads do you generate on average per month and what is your average conversion. If leads go up after installing a content marketing process then it must (allowing for a small amount of variance) be due to the process. It is then possible to calculate (roughly) extra sales generated and compare that to the cost of the content marketing process. That is a totally logical approach and makes a lot of sense. Incremental value over incremental cost = ROI. Thanks for sharing your approach.